What do the CERN experiments tell us about global warming? The CERN experiment only tested one-third of one out of four requirements to blame global warming on cosmic rays. At least two of the other requirements (strengthening solar magnetic field, fewer cosmic rays reaching Earth) have not been met over the past 50 years. The lead scientist in the CERN CLOUD experiment explicitly stated that the experiment "actually says nothing about a possible cosmic-ray effect on clouds and climate." Many other studies have concluded that cosmic rays play a minor role in cloud formation, and have not contributed in any significant way to the global warming over the past 50 years. Many climate "skeptics" have claimed that CLOUD at CERN has “proven that cosmic rays drive climate change”, or something to that effect. Unfortunately for “skeptics” (and if we don’t reign in greenhouse emissions, everyone else), it’s not true. While cosmic rays may have some influence on cloud formation, they are not responsible for the present, human-driven climatic change or alleged changes in the geologic past. Although seemingly out of fashion for a while until recently, the “cosmic rays are driving climate” myth has long been one of the mainstays of the self-contradictory climate “skeptic” argument stable, and it’s something covered fairly often at The Way Things Break (previous posts here, here, here, here, here, and here). And as with any good falsehood, it starts with a kernel of truth. "By altering the population of CCN and hence microphysical cloud properties (droplet number and concentration), cosmic rays may also induce processes analogous to the indirect effect of tropospheric aerosols. The presence of ions, such as produced by cosmic rays, is recognised as influencing several microphysical mechanisms (Harrison and Carslaw, 2003). Aerosols may nucleate preferentially on atmospheric cluster ions. In the case of low gas-phase sulphuric acid concentrations, ion-induced nucleation may dominate over binary sulphuric acid-water nucleation." While a plausible mechanism exists, real world verifications are necessarily difficult to undertake. The CLOUD project at CERN is seeking to do exactly that. The “skeptic” and right wing blogospheres are abuzz because Jasper Kirkby, et al. have just published the first results in Nature (Kirkby 2011). "[The paper] actually says nothing about a possible cosmic-ray effect on clouds and climate, but it’s a very important first step." More recently, in May 2013 Kirkby reiterated this point. "At the present time we can not say whether cosmic rays affect the climate"
While the CLOUD results provide some confirmation of the potential mechanism by which GCRs might induce cloud nucleation, they in no way demonstrate that GCRs do significantly promote cloud formation in the real world, let alone support the myth that GCRs drive significant climatic change. Taken at face value the CLOUD results would indicate an increase in nucleation rate of about 3 orders of magnitude in going from the equator to a latitude of 80. Even allowing for various reductions due to ‘sinks’ (Kirkby 2012, private communication), a big change should surely follow. 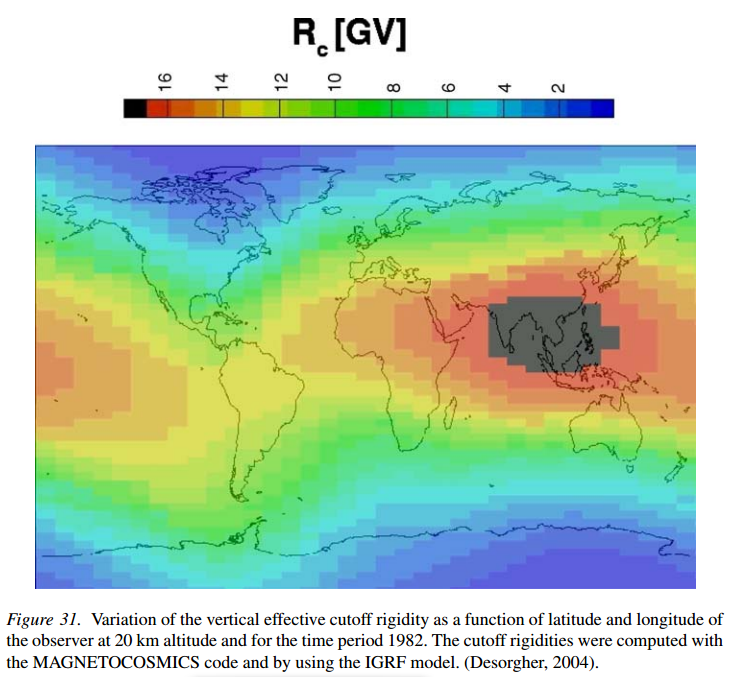 A search for the latitude dependence of the [cosmic ray, low cloud] correlation, or the related dependence on the [cosmic ray] vertical rigidity cut-off (VRCO), gave negative results (Sloan and Wolfendale 2008), and indeed, this was one of the ﬁrst demonstrations of the lack of a genuine [cosmic ray, low cloud] correlation. A latitude dependence of the correlation was not detected at any altitude, in fact. Thus, the expected big change with latitude for H2SO4 nucleation anywhere is not observed. “But wait!” I’m sure some of you may be thinking, “the CLOUD results themselves don’t disprove GCRs drive significant climatic changes.” And that’s true enough. How Do We Know That Cosmic Rays Aren’t Driving Significant Climatic Change? In reference to the present anthropogenic climatic changes that we’re driving through alteration of the planetary energy balance notably through greenhouse gas emissions, we can theorize what certain “fingerprints” of enhanced greenhouse warming should look like, and examine observational data to see whether those fingerprints show up. And they do. Moreover, we can examine the claims made by Svensmark, Shaviv, and others who proclaim GCRs drive climate and see whether or not they hold up. They don’t. We can look at the paleoclimatic record during periods of significant changes in GCR activity, and there is no corresponding change in climate, e.g. the Laschamp excursion ~40kya (Muscheler 2005). We can examine the change in GCRs in response to solar variability over recent decades or the course of a solar cycle, and find there is no or little corresponding change in climate (Lockwood 2007, Lockwood 2008, Kulmala 2010). We can look at alleged correlations between GCRs and climate in the geologic past due to our sun passing through galactic spiral arms, and find that these “correlations” were based on an unrealistic, overly-simplified model of spiral structure and are not valid (Overholt 2009). Standard climatic processes (like CO2) more parsimoniously explained the climatic changes even before taking the flawed spiral model into account (Rahmstorf 2004). We can examine the specific mechanisms by which Svensmark and others have claimed GCRs influence climate via cloud behavior and show that alleged correlations between GCRs and clouds were incorrectly calculated or insufficiently large, proposed mechanisms (e.g. Forbush decreases) are too short lived, too small in magnitude, or otherwise incapable of altering cloud behavior on a large enough scale to drive significant climatic change (Sloan 2008, Erlykin 2009, Erlykin 2009a, Pierce 2009, Calogovic 2010, Snow-Kropla 2011, Erlykin 2011). Basically, what’s actually been demonstrated by Kirkby, et al. isn’t at odds with the IPCC. What is at odds with the IPCC hasn’t been demonstrated by Kirkby, et al. And the claims by Svensmark, Shaviv, and other ‘GCRs drive climate’ proponents have been debunked at pretty much every step of the way. GCRs may have some influence on cloud behavior, but they’re not responsible for significant climatic changes now or in the geologic past. The CLOUD project at CERN is essentially just getting started. Its preliminary findings will help aerosol modelers, and hopefully it will continue to provide useful results. After the initial furor of “skeptic” blog-spinning dies down, cosmic rays will probably find themselves falling out of favor once again. But there’s no such thing as too debunked when it comes to myths about climate change, and there’s little chance this will be the last time cosmic rays will be trotted out to claim that we don’t need to reduce greenhouse gas emissions. Calogovic, J., et al. (2010): Sudden cosmic ray decreases: No change of global cloud cover. Geophysical Research Letters, 37, L03802, doi:10.1029/2009GL041327. Erlykin, A.D., et al (2009): Solar activity and the mean global temperature. Environmental Research Letters, 4, 014006, doi:10.1088/1748-9326/4/1/014006. Erlykin, A.D., et al (2009a): On the correlation between cosmic ray intensity and cloud cover. Journal of Atmospheric and Solar-Terrestrial Physics, 71, 17-18, 1794-1806, doi:10.1016/j.jastp.2009.06.012. Erlykin, A.D., and A.W. Wolfendale (2011): Cosmic ray effects on cloud cover and their relevance to climate change. Journal of Atmospheric and Solar-Terrestrial Physics, 73, 13, 1681-1686, doi:10.1016/j.jastp.2011.03.001. Erlykin, A. D., T. Sloan, and A. W. Wolfendale (2013), A review of the relevance of the “CLOUD” results and other recent observations to the possible effect of cosmic rays on the terrestrial climate, Meteorol Atmos Phys, 1–6, doi:10.1007/s00703-013-0260-x. Kirkby, J., et al. (2011): Role of sulphuric acid, ammonia and galactic cosmic rays in atmospheric aerosol nucleation. Nature, 476, 429–433, doi:10.1038/nature10343. Kulmala, M., et al. (2010): Atmospheric data over a solar cycle: no connection between galactic cosmic rays and new particle formation. Atmospheric Chemistry and Physics, 10, 1885-1898, doi:10.5194/acp-10-1885-2010. Lockwood, M., and C. Fröhlich (2007): Recent oppositely directed trends in solar climate forcings and the global mean surface air temperature. Proceedings of the Royal Society: A. 463, 2447- 2460, doi:10.1098/rspa.2007.1880. Lockwood, M., and C. Fröhlich (2008): Recent oppositely directed trends in solar climate forcings and the global mean surface air temperature. II. Different reconstructions of the total solar irradiance variation and dependence on response time scale. Proceedings of the Royal Society: A, 464, 1367-1385, doi:10.1098/rspa.2007.0347. Muscheler, R., et al. (2005): Geomagnetic field intensity during the last 60,000 years based on 10Be and 36Cl from the Summit ice cores and 14C. Quaternary Science Reviews, 24, 16-17, 1849-1860, doi:10.1016/j.quascirev.2005.01.012. Overholt, A.C., et al. (2009): Testing the link between terrestrial climate change and galactic spiral arm transit. The Astrophysical Journal Letters, 705, 2, L101, doi:10.1088/0004-637X/705/2/L101. Pierce, J.R., and P.J. Adams (2009): Can cosmic rays affect cloud condensation nuclei by altering new particle formation rates? Geophysical Research Letters, 36, L09820, doi:10.1029/2009GL037946. Rahmstorf, S., et al. (2004): Cosmic Rays, Carbon Dioxide, and Climate. Eos Transactions AGU, 85(4), doi:10.1029/2004EO040002. Sloan, T., and A.W. Wolfendale (2008): Testing the proposed causal link between cosmic rays and cloud cover. Environmental Research Letters, 3, 024001, doi:10.1088/1748-9326/3/2/024001. Snow-Kropla, E.J., et al. (2011): Cosmic rays, aerosol formation and cloud-condensation nuclei: sensitivities to model uncertainties. Atmospheric Chemistry and Physics, 11, 4001-4013, doi:10.5194/acp-11-4001-2011. Try as hard as I might, I cannot see why proving that climate change is human in origin should have any bearing on the need to take action. We know that atmospheric CO2 acts as a greenhouse gas and we know how to reduce the amount of it we humans release into the atmosphere. So let's just get on with reducing it. Every time we argue about whether the change in the climate that we are experiencing is human in origin or not gives the politicians, who have an urgent need to protect their job in elections that come by every four or five years, an excuse to procrastinate. And heaven knows they have been excellent procrastinators when one looks at what has actually been achieved since Kyoto. It sickens me to think that Monckton and his ilk are winning hands down as things are. Though I doubt they will enjoy the prize they earn. I have given the example elsewhere on this site that you would not refuse to change direction or speed because the iceberg dead ahead is not human in origin. Response: [muoncounter] You're wildly off-topic for this thread (which should have links to all of the existing it's not cosmic rays threads). I was looking for this argument on the "Climate myths sorted by taxonomy" page, but I could not find it. Is there a reason it isn't on that page, and if not, would someone who can consider adding it there? I imagine it should be added under "It's cosmic rays". It is sadly amazing how such things take a life of their own. However the letter did send me looking for what the experment was doing. As is often the case, some folk put words into scientists' mouths without first asking them. I commend you for your strictness in interpreting the results of the Cloud Experiment. As you quite rightly say, the lead author (Jasper Kirby) has been very cautious in his claims, limiting himself to the results of the CERN experiments. You can see this very clearly in the recent paper that reports the experimental results. In his lecture available via Youtube, Dr Kirby was careful to warn his audience concerning the uncertainties in the putative mechanism relating GCR to climate via cloud formation. There is a big ? mark in the graphic and he points it out to the audience. In an earlier paper Dr Kirby was likewise cautious about what was expected from the Cloud Experiment, together with the uncertainties in relation to climate. nucleation of new aerosols in the atmosphere, the possible contribution of such new particles to changes in the number of cloud condensation nuclei remains an open question." Page 32. Cosmic Rays, Clouds, and Climate (CERN-PH-EP/2008-005, 26 March 2008. Surveys in Geophysics 28, 333-375. Only the most intrepid readers will wish to study the full paper, however the Youtube video contains the gist of the paper and several of the graphics. Dr Kirby's presentation is clear and I believe accessible to non-physicists. There is a reference to protons and muons at one point, but readers of your blog will know that Wikipedea has good explanations of these. Quick question: What would the cosmic ray hypothesis say about the effect on upper atmosphere temperature change? jd_germany, assuming we are talking about the 'cosmic ray hypothesis' which holds that 'a decrease in cosmic rays penetrating the atmosphere could lead to decreased cloud formation and thus increased solar radiation reaching the surface' (there are others) then there would be no change in the 'greenhouse effect' and we wouldn't expect to see the cooling of the upper atmosphere (i.e. stratosphere) which is characteristic of greenhouse warming (yet, we do). Similarly, if global warming were being driven by increased solar radiation (introduced by cosmic rays or otherwise) then we would expect to see the greatest warming increases during the day (we don't), in summer (nope), and near the equator (wrong again). In short, this 'hypothesis' is sort of the opposite of scientific progress... multiple lines of evidence all converge to show that it is false. Based on the abundant literature that does exist supporting the influence of Cosmic Rays on Earth's climate, how can anyone justify the IPCC ignoring cosmic rays and scenarios for stronger solar forcing in some of their global climate model iterations? The sun's activity significantly increased coeval with industrialization into a sustained solar max (see first link below), and it seems critical to understand the role of both solar activity and AGW to attempt to model Earth's climate. Pnas 9400 yr cosmic ray record correlated with asian monsoon. Geel, B.V. Raspopov, O.M. et al. The role of solar forcing upon climate change, Quaternary Science Reviews 18 (1999), pg 331-338. This list is just a fraction of the papers that support Cosmic Ray's forcing Earth's climate. What is the threshold for literature supporting cosmic rays to consider them as part of the climate system? It seems pages like this keep deflecting the data driven debate and not dealing directly with the issue- now CERN and several other respectable climate physics labs have collectively made a statement in 'Nature' about the uncertainty of the models: "This could raise the baseline aerosol state of the pristine pre-industrial atmosphere and so could reduce the estimated anthropogenic radiative forcing from increased aerosol-cloud albedo over the industrial period." I fear the threshold has been crossed and ignoring the context of the evergrowing literature and data about Cosmic Rays and the potential for a stronger sun for Earth's climate has become "DENIAL" of natural climate change potential that doesn't fit the IPCC dogma and introduces uncertainty in model predictions. Furthormore, this sort of denial could eventually erode public opinion of science and actually fuels the unwaranted denial of GHG influences and anthropogenic climate change. Aaron S - Your first reference details isotope proxy issues for cosmic ray and solar activity, not climate change, your second states "..although CR clearly do not contribute measurably to the 20th-century global warming trend, they do appear as a nontraditional forcing in the climate system on short interannual timescales, providing another interesting piece of the puzzle in our understanding of factors influencing climate variability"; and even that influence is only supported by a minority opinion. Add to that the facts that even the most generous estimates of CR influence are very very small, and that CR trends over the last century would by those supposed mechanisms be a _cooling_ influence, and it's no surprise that CR influences aren't considered a smoking gun in recent warming. But not ignored; there is considerable discussion of CRs in IPCC AR5 WG1, Chapter 7, Clouds and Aerosols. You might want to look there before claiming that some significant issue is being overlooked. KR. Did you read the papers? Perhaps a reread is in order based on the consistent inconsistencies between your reply and the papers.
" A comparison of the derived solar activity with a record of Asian climate derived from δ18O in a Chinese stalagmite reveals a significant correlation. The correlation is remarkable because the Earth’s climate has not been driven by the Sun alone." So I am unclear what you mean by "not climate change"? It seems you missed a major part. Second paper your quote is correct- the "Causation" was only found between CR and HadCrut3 after removing the warming trend. That is huge by itself and basically shows CR force climate, and yes the majority of modelers don't like this result- but I consider that as invalid reasoning for the validity of the conclusion. Also, please note that paper finds significant correlation between CR (AA) and the longer term (century scale) Gobal Temp trend (HC3), but not causation. The correlation is still significant and itself greatly strenghtens the case that CR play a role in climate change. It says little that it didn't pass the causation test becasue the Signal Noise Ratio was short given the data evaluated. I would be surprised to get a positive outcome for a centruy trend in a century and half of data. It would be a facinating study to use the 9400 yr data from the first paper and evaluate for causation as SNR increases with N.
Third. You say "CR trends over the last century would by those supposed mechanisms be a _cooling_ influence". Now I am really starting to question if you even read the papers as there is a significant increase in solar activity over the last century-> stronger magnetic field -> less CR -> Less high albedo clouds -> more irradiance and warmer earth, and the last century stands out as one of 2 major increases in solar activity based on the isotope data, and is exceptional in the AA index, and SSN. You are probably confused about the duration of the trend becasue it is true that the last decade the sun's activity has dropped. Of course, this is when the models start to run cool compared to the measured global temperatures of the satellite and Had Crut data sets, and given lags are a reality- we don't know the role of the decrease in solar activity yet. Final point- Yes the IPCC discusses this in the text, but which model itteration has a stronger sun that considers CR? The text concludes not to use for models, models are used for predictions, predictions are used by society. I fail to see that there is any "abundant literature that does exist supporting the influence of Cosmic Rays on Earth's climate." You certainly provide no evidence for such literature. Your first citation Steinhilber et al (2012) is certainly not part of such a literature as it tells us "TSI is taken as a proxy of solar activity" which is the particular position that Svensmark (& apparently you also) argue against. Perhaps you misinterpret the Steinhilber et al. comparison of their 9,200-year TSI record with the Dongge Cave δ18O record. This comparison is not used to demonstrate some grand sun-effect on climate but rather to show the wobbles in their 9,200-year record can be found in climate data. "it is important to stress that they (ie the findings) do not suggest that CR (cosmic ray) influences can explain global warming and should not be misinterpreted as being in conflict with the IPCC. Indeed, the opposite is true: we show specifically that CR cannot explain secular warming." I thus fail to see any coherent representation of an "abundant literature" supporting your position on the effects of cosmic rays on climate or your assertion that there is some sort of denial required to enable the IPCC's conclusions. I also find fault in your description of the trend in solar output, specifically that over the last century it has been a rising one. Solar output did rise strongly 1900-60 but has since been on a declining trend. There has been decline not rise for the last 60 years. Note that my position on all this is not anywhere greatly different to the comment by KR @8. I think Richard Alley pretty much killed the cosmic ray hypothesis here. The relevant part of the lecture starts at 42:00 if you don’t have the time to listen to all of it. 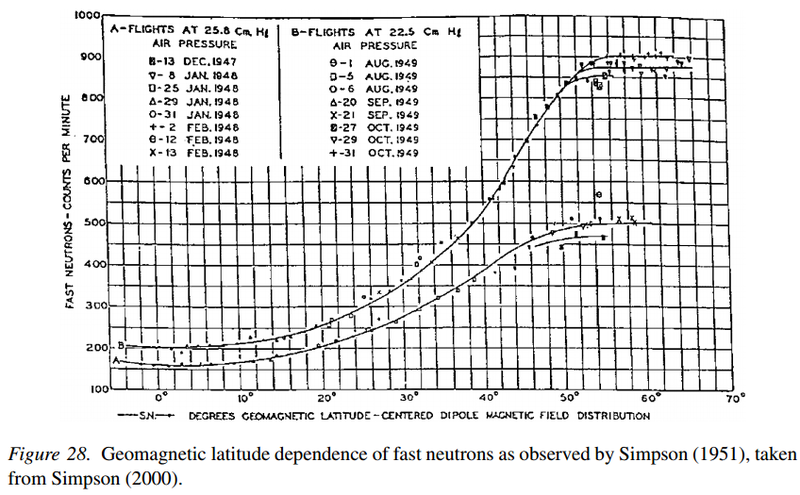 Below is the chart he’s referring to, showing how the flux of beryllium-10 produced by cosmic rays greatly increased as the Earth’s magnetic field weakened by 90 % about 40,000 years ago. The climate ignored it and that should be the end of the story. I fail to see the connection between Earth's magnetic field, and the Sun's magnetic field. Are we are discussing climate relative to the sun's magnetic field deflecting Galactic Cosmic Rays? The Earth is something like a millionth the volume of the sun, and its magnetic field is weak regarding our solar system deflecticing Galactic Cosmic Rays. The Sun is the player in our solar system. I need to watch the video- perhaps I am missing something, but no way does Alley imply we are talking solar cosmic rays. Then I can Revert. "This could raise the baseline aerosol state of the pristine pre-industrial atmosphere and so could reduce the estimated anthropogenic radiative forcing from increased aerosol-cloud albedo over the industrial period." "his comparison is not used to demonstrate some grand sun-effect on climate but rather to show the wobbles in their 9,200-year record can be found in climate data." "Your first citation Steinhilber et al (2012) is certainly not part of such a literature as it tells us "TSI is taken as a proxy of solar activity" which is the particular position that Svensmark (& apparently you also) argue against." I don't understand what you mean. TSI is used for a proxy of solar activity. Solar Activity includes TSI, as well as magnetic field strength. Solar Forcing is the combination of both (perhaps even additional contributions from the exagerated flux of the UV spectrum of TSI). "The new cosmic radiation record enables us to derive total solar irradiance, which is then used as a proxy of solar activity to identify the solar imprint in an Asian climate record. Though generally the agreement between solar forcing and Asian climate is good, there are also periods without any coherence, pointing to other forcings like volcanoes and greenhouse gases and their corresponding feedbacks. The newly derived records have the potential to improve our understanding of the solar dynamics and to quantify the solar influence on climate." I think I am picking something up here: Are you guys thinking cosmic rays are from the sun- ie random solar storms that may interact with Earth? Just to be clear, the Svensmark theory are talking about Galactic cosmic rays from super nova explosions across the universe. These are relatively constant and originate from many different directions. The sun's magnetic field deflects these depending on strenght of solar activity, and then cloud cover is impacted by the amound of Galactic Cosmic Rays reaching the Earth. Yes the Earth's field plays a minor role to but clearly minimal compared to the sun. Yes our sun's cosmic rays can play a role in short term cloud cover and "weather" not climate, but again this is not what the Cosmic Ray theory is implying. Tsonis et al (2015)- Please don't bring character into a data debate- not professional. I need to read your links to understand the problems. Have to revert back later. Really in fig 3D of the Steinhilber et al (2012) you don't see in 1910 we were in a solar minimum, characterized by increased CR intensity (weaker solar mag field, more cosmic rays, more nuclei, more clouds, more albedio, less sunlight), then by 1950 to 2000 we were in a very large and sustained solar max. Basically you have a very steep slope 1910 to 1950, then a very minor slope 1960 to 2010. This is difficult for me to understand how you say: "specifically that over the last century it has been a rising one." Furthermore, it is ironic to me when lags are accepted for things like the hiatus, but the role of the sun is considered invalid if there is a lag from say ocean circulation or whatever. It is bad logic. The Sun’s magnetic field doesn’t stop all the cosmic rays from entering the inner parts of the solar system. The Earth’s own magnetic field stops much of the remaining from entering the atmosphere. A weakening of the Earth’s magnetic field – as happened during the Laschamp event – will thus have the same impact as the weakening of the Sun’s magnetic field during low solar activity. As the chart in my last post shows, the flux of beryllium-10 (a proxy for cosmic rays hitting the atmosphere) nearly doubled. That change is comparable to the typical changes from solar maximums to solar minimums, but it lasted several hundred years. That should make any significant climate impact measurable in the climate proxies, but there is none. "We had a big cosmic ray signal, and the climate ignores it. And it is just about that simple! These cosmic rays didn’t do enough that you can see it, so it’s a fine-tuning knob at best." Like I said in my last post: Richard Alley pretty much killed the cosmic ray hypothesis! Do you not feel it is exceedingly presumptive of you to ask me, while examining your "abundant literature" on this subject of Svensmark's cosmic-ray conjecture, whether I have "addressed the new Nature paper"? Do you not realise that you had until now entirely failed to include this paper in your listing of "abundant literature"? And am I not disputing the existance of such an "abundant literature" and disputing your inclusion of papers you have so far listed? I am thus hardily the one who would know what you would or would not choose to include in your "abundant literature"!! This particular paper Kirkby et al (2016) 'Ion-induced nucleation of pure biogenic particles' does follow on from papers addressed in the Original Post so comment on this new paper's relevance could be requested from the OP authors. "The latest experiments suggest that it may have been cloudier in pre-industrial times than previously thought. If this is so, then the masking effect, and in turn the warming effects of carbon dioxide, might have been overestimated, ... (but) ... itis too early to say whether this is true in practice, or by how much, because there are so many factors that play into such projections,"
And that comment is from one who in the past was supportive of Svensmark's conjecture. (The apperance in the paper's references of Kirkby (2007) 'Cosmic-rays & climate.' is indicative that the situation continues.) The other comment in the same Nature News item (from Knutti) says that the results will probably not affect the most likely projections of warming, as laid out by the Intergovernmental Panel on Climate Change. "Our best estimate is probably still the same," he says. Regarding your various confusions w.r.t. Steinhilber et al (2012), you first confusion concerns quotes from the conclusions of their paper. Identifying how they reach such conclusions may be worth your consideration. Note that the word "significant" is used in a statistical sense & the word "remarkable" may be used more in its original less-sensational sense, meaning 'something worthy of remark'. Your second confusion appears to show you do not truly understand the first sentence of the Steinhilber et al (2012) abstract (You helpfully quote it @13.) which is perhaps clearer than my chosen quote from the paper. And just to be totally clear, the concensus view is that cosmic rays do not impact greatly on climate. The Steinhilber et al. position is that cosmic radiation proxies can be used also as proxies for solar magnetism and so in turn as proxies for TSI. Note this is the first three items in your causal chain @9 but backwards. Increase in solar activity-> stronger magnetic field -> less CR -> Less high albedo clouds -> more irradiance and warmer earth. The final two items are entirely absent (even by implication) from Steinhilber et al (2012) and thus their position represents a concensus position. The position presented by Tsonis et al (2015) is different: that a cosmic ray effect does exist which isn't yet addressed by climate modelling but that it is importantly not responsible for the recent global warming. A third position which is the one you appear presently signed-up to is the Svensmark conjecture that asserts that a major portion of the recent global warming results from cosmic-ray variations. Concerning Tsonis et al (2015), the links @10 are presented for completeness & are in themselves of no great importance. Regarding Tsonis & Swanson, their seemingly-never-ending publications on what developed into their 'synchronised coupling' model of climate perhaps has apparently and thankfully ended with Tsonis & Swanson (2012). I feel that "dodgy" a reasonable description of it. If I address "character" it is the character of their writings not their persons so you high horse has no place here. "the last century stands out as one of 2 major increases in solar activity based on the isotope data, and is exceptional in the AA index, and SSN. You are probably confused about the duration of the trend becasue it is true that the last decade the sun's activity has dropped." Unless you want to revise it, this statement very clearly implies you see a "trend" which is "one of 2 major increases in solar activity" lasting a century. You may not feel a century-long rise is much different to six decades of rise & four decades of slight decline, but the arbitor in this is the global climate and for the climate, the difference would be stark indeed. "I fail to see the connection between Earth's magnetic field, and the Sun's magnetic field. Are we are discussing climate relative to the sun's magnetic field deflecting Galactic Cosmic Rays? The Earth is something like a millionth the volume of the sun, and its magnetic field is weak regarding our solar system deflecticing Galactic Cosmic Rays." "Primary cosmic-ray particles with energies <10 GeV are modulated by the solar wind and by the Sun's 11-year solar activity cycle (Lal and Peters 1967, Eidelman et al. 2004). As a consequence of this modulation, galactic cosmic-ray particles with rigidities (see text box) smaller than 0.6 GV on average (Michel et al. 1996) cannot approach the Earth (at present the solar modulation potential parameter φ ranges from 0.3–1.2 GV, depending on solar activity; Michel et al. 1996, Masarik and Beer 1999, Usoskin et al. 2005, Wiedenbeck et al. 2005; see also Fig. 1.1). Near-vertically incident particles dominate the primary cosmic-ray flux near the Earth's surface (Dorman et al. 1999; see also Section 1.3). Consequently, primary particles approaching the Earth's geomagnetic equator travel perpendicular to the geomagnetic field, whereas near the poles they travel essentially parallel to the magnetic field lines. Virtually all rigidities are permitted at the poles, while near the equator, rigidities well in excess of 10 GV are required to approach the Earth. The solar modulation limits the lowest energies at the poles to > 0.6 GV, having a consequence that the cosmic-ray flux does not increase monotonously approaching the poles, but levels off at rigidities close to the solar modulation potential (Fig. 1.4). Furthermore primary particles with energies close to the solar modulation potential are not energetic enough to generate a secondary particle cascade that can reach the surface. The resulting break in trend at high latitudes is referred to as the ‘latitude knee’. The decrease of the cosmic-ray flux with decreasing latitude below the latitude knee is sometimes referred to as the ‘latitude effect’." In short, the rigidity induced by the Earth's magnetic field at the equator is approximatly 17 times that induced by the Sun, but while that induced by the Sun filters particles based on momentum equally regardless of terrestial location, the much larger terrestial rigidity at the equator falls to zero at the poles. That means in turn that the Laschamp event resulted in a large increase in bombardment of the Earth by galactic cosmic rays at the equator, but virtually zero effect at the poles. It also follows that the lack of climate perturbation at the Laschamp event represents a serious problem for the GCR/climate connection. That creates further problems for the theory. First, it means the strongest effect is at the poles, ie, where clouds overly ice and snow so that any change of albedo in the clouds will have limited effect on the albedo fo the Earth. Second, because of the angle of incidence, insolation per square meter at the surface (or cloud top) varies approximately with the cosine of latitude - approaching zero at the poles. So, the strongest impact of GCR on cloud albedo (if there is one) will be located where it has minimal impact on the energy budget. 3) I passed without note above that the cut off rigidity due to solar effects varies from 0.3 to 1.2 GV over the solar cycle, ie, by a factor of 4. In contrast, TSI varied by 0.12% between the solar maximum of 1958 (the strongest on record) and the solar minimum of 2008 (the weakes recent minimum). That difference in effect means it is not reasonable to assume that the GCR effect on climate (if there is one) is a linear function of TSI. Unfortunately I know of no formulation be advocates of the theory of what the relationship will actuall by (other than an assumed linear relationship). If somebody does know of such a formulation, I would welcome a link to it. Absent a formulation, however, the 'theory' that GCR effect climate is no sufficiently advanced as to even quantify the forcing effect. Indeed, given that the strongest effect will be at the poles where the greenhouse effect of clouds is far more significant than their albedo (because of the albedo of the underlying snow and ice), it cannot even securely determine the sign of the effect. That means in scientific terms it is not yet a theory, but at best a hint as to how a theory might be developed. 4) Despite (3) above, I will follow standard practise in this case and use TSI as a proxy for TSI plus GCR forcing. I will justify this base on the fact that if TSI plus GCR forcing increases at less than a linear rate with respect to increases of TSI, any GCR effect will be minimal and largely irrelevant. If it increases at greater than a linear rate, that should exagerate the apparent effect of TSI on climate even more than is shown by the linear assumption. Failure of a significant correlation between TSI and temperature will therefore show that the GCR effect is either very weak, or rises at a less than linear rate with rising TSI (and therefore is self damping). It is very clear that there is a poor correlation between the two. Indeed, the correlation between the unnormalized, annual values is just 0.416, with an r^2 of 0.173. Intuitively that means TSI explains 17.3% of the variation in temperature at most. Likely it explains much less once we allow for coincidental events and independence effects. 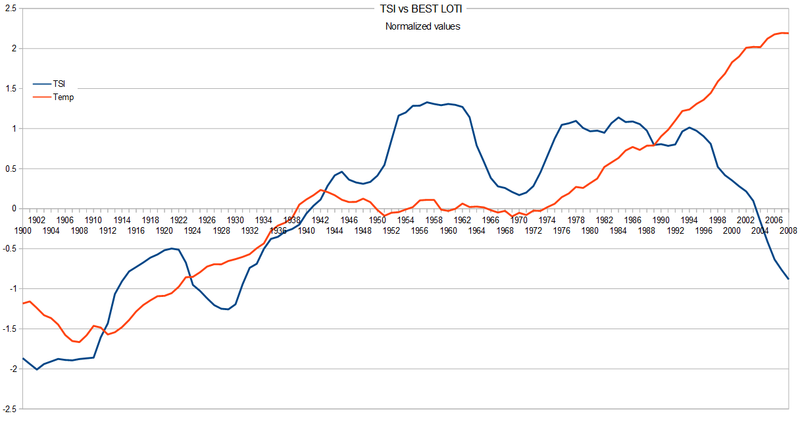 For comparison, the correlation between CO2 concentration and the BEST LOTI (1850-2013) is 0.902, with an r^2 of 0.814. I sincerely do appreciate such a thought out and well written response by Tom Curtis and others. So I want to reply with my concerns. 1) You are correct- the correlation is poor since about 2000. However, if you factor in this was a massive solar max based in isotopes and SSN and if you consider lags in the system associated with oceanic circulation (like AGW theory does for the delay in Antartic warming or PDO and the Hiatus) then you could increase stored heat and continue to even warm beyond the decrease in forcing when stored heat is realeased later. I have zero issue with the PDO storing heat for an entire negative positive couplet and there are much longer circulation cells. Let us remember to- I do believe in AGW and CO2 as a GHG- I just think ignorming solar activity and cosmic rays is not valid based on existing data. Also there is the obvious- the correlation between slope of warming trend in Hadcrut and A2 model warming has poor correlation over the same duration (The Hiatus is Real- Roberts et al. Nature CC 5, 2015). So correlation in this case is not a good argument either way as we are both aware climate is a complex system with feedbacks and lags. 2) Maunder minimum to modern maximum is a totally different situation than a Schwabe 11 yr minimum during a max or a decent from a max and we have not observed the impact from direct obserbations; the isotope record (Steinhilber et al) shows the intensity of the dipole is about the same (a little less for the dipole) as the intensity during the change from the Maunder to the modern max. Furthermore, the Maunder-scale cycles have much higher periodicity than the dipole- which means the wave has more energy given about the same amplitude. Period is important and if I speculate and dream a bit perhaps there is a dynamic equilibrium reached with longer duration changes related to the dipole that minimizes the impact. So I don't get your argument or suggestion that it is 17x the strength because isotopes (only data we have) say otherwise and the higher frequency change also supports more energy for the Sun. So considering that you don't have direct measurments to address anything but the interval during a solar max it seems a rather biased evaluation to me, but perhaps I am missing something as this is a stretch for my understanding. Thanks for making me think about this- it was a pleasant challenge and good learning. 3) Short term solar storms may not be long enough duration to trigger a response. The causal relationship between CR and intra annual solar activity is weak, but they are related to intra-annual events not short pulses. 4) The Earth's magnetic field is dynamic and dominates the Tropics- Agreed. Thanks for sharing that data. I think you need to add "during a solar max" because we don't know what the Maunder looked like- but it did likely impact Northern latitudes. Perhaps this explains the regional nature of the Little Ice Age. 5) You do not address the very strong correlation between the monsoon and cosmic ray intensisty. Correlation requires caution, but each vary greatly in time with a significant decadal scale lag of climate behind magnetics. THis pattern supports causation rather strongly. Nor do you address the quantified causal relationship at the intra-annual period in the other paper. 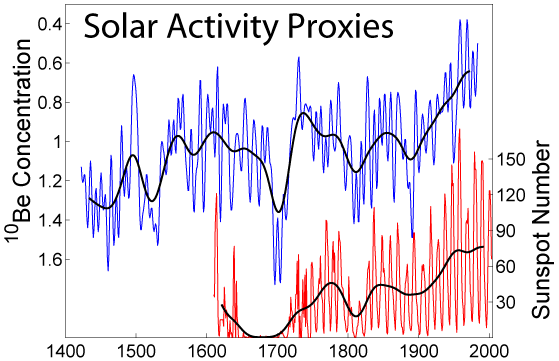 Also, there is data from other proxy that climate responds to the sun's magnetic field. Each support the point in a independent way. I am fortunate- I am arguing that there is now sufficient evidence to include a stronger sun scenario into the climate models. It is much more difficult to defend than your position to not consider the data validn. Your data is to short (during the max) or to long (100k yr doesn't have century scale resolution) for me to say it meets this threshold. Cosmic rays need included in the models. Thanks for the opportunity to learn- you are a good teacher. New paper from CERN experiment : "A significant fraction of nucleation involves ions, but the relatively weak dependence on ion concentrations indicates that for the processes studied variations in cosmic ray intensity do not significantly affect climate via nucleation in the present-day atmosphere." The Cosmics Leaving OUtdoor Droplets (CLOUD) experiment was created to systematically test the link between galactic cosmic rays (GCRs) and climate; specifically the connection of ions from GCRs to aerosol nucleation and cloud condensation nuclei (CCN), the particles on which cloud droplets form. The CLOUD experiment subsequently unlocked many of the mysteries of nucleation and growth in our atmosphere, and it has improved our understanding of human influences on climate. Their most recent publication [Gordon et al., 2017] provides their first estimate of the GCR-CCN connection, and they show that CCN respond too weakly to changes in GCRs to yield a significant influence on clouds and climate. I can't find a robust reference to this, does anyone know its origins? Also, has anyone seen this covering a longer period in history? Assuming it is accurate it does suggest a good correlation, but this has to be a complex one. TSI alone does not explain it as this varies surprisingly little. CLOUD seem to have found strong evidence that extremely small amounts of aerosols have big effects on cloud formation, but the role of cosmic rays still seems inconclusive. Again assuming the above mentioned graph is correct, are we still searching for an explanation for the apparently good correlation between sun spots and temperature? Anyone know what CLOUD's future agenda is in this regard. [PS] Fixed link. Please see "Solar Cycle Length proves its the sun" myth. Any replies, comment on that thread please, not here. You might also note that gif from anti-science group "Friends of Science" is of the data without the arithmetic mistake corrected, despite this being known since 2000. That graph appears here having been "adapted by Dr. Tim Patterson.from: Friis-Christensen, E., and K. Lassen, Science, 254, 698-700, 1991." Thus the original is Fig 2 of that paper. The level of nonsense and error engendered by that particular exercise in curve-fitting is set out in this SkS post. Hi there, this is my first post to your site and is more of a question than a comment. I recently had the misfortune of watching the documentary "The Cloud Mystery" which presented Henrik Svensmark's Cosmic Ray Theory (CRT) as being the driving force for climate change. The documentary did not appear to be solid science to me which is why i was surpised CERN appeared to be reasearching CRT for climate change. Aside from the documentary's lack of defining or explaining scientific terms, and, misrepresentation of the fundementals Geology and Atronomy, i.e., our solar system does not move to different arms of our galaxy as we orbit the galactic center, the documentary really didn't adress a basic question. Do we need cosmic rays to create aerosols for cloulds to form? Are cosmic rays the only way to get aerosols in the astmosphere? Is there or was there ever a shortage of aerosols in our atmosphere that prevented cloud formation thus making our asmosphere supersaturated with water vapor that couldn't condense? This is just my cursory look at the CRT for climate change, but it appears to me that the CRT may be a solution to a problem that doesn't exist. Your specific questions (and also your comments about the galaxy) raise some subjects that are complex and so not yet entirely resolved by science. However it is straightforward to answer your last two questions (2) that cosmic rays are indeed not the only route to forming aerosols, and (3) if there were no aerosols their absence would have fundamental impacts on climate. You would still get ground condensation and presumably any supersaturated atmosphere would still form clouds but at much greater altitudes. Globally that would be a recipe for a run-away greenhouse effect. That leaves your first question which is perhaps better framed by asking "How important are cosmic rays in cloud formation?" Svensmark's work is entirely unreliable on this matter, but that is not because he fundamentally misrepresents the motion of the solar system through the galaxy. 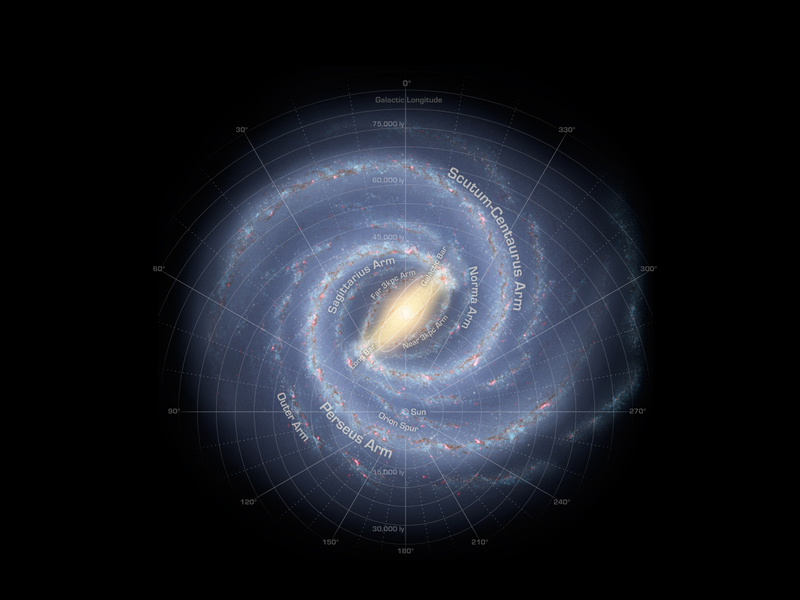 The present structure of the outer Milky Way is now understood but there is still scientific debate over the dynamics of galactic arms. Yet there are surely no theories that don't included the sun moving between arms of the galaxy, this on a scale of ~100 million years/arm. One problem for the likes of Svensmark is that the arms are not neatly positioned (as described by Overholt et al (2009) featured in the OP shows). Yet Svensmark (2012)'s calculated Super Nova rates (see his Fig 6) somehow still manage to provide a pretty strong rhythmical pattern. At present the sun is also is moving away perpendicular to the disc of the galaxy and this is part of an oscillation which sees the sun returning through the disc every 35million years or so. Svensmark seems to ignore this ~35Ma oscillation. Not so Shaviv, one of his co-presenters in "Mystery of Clouds." The work of Shaviv et al (2014) "yields a prominent 32 Ma oscillation with a secondary 175 Ma frequency modulation. The periodicities and phases of these oscillations are consistent with parameters postulated for the vertical motion of the solar system across the galactic plane, modulated by the radial epicyclic motion." Shaviv et al do not then make a 'Svensmark leap' and so do not insist this finding proves a cosmic ray effect. And quite right too, especially for the 175Ma finding. Of course, all this palaeo-climate stuff will not directly impact the climate variability of the last few decades. Yet if we assume the mechanism is resulting from cosmic rays and if you can assess the size of the palaeo-cosmic ray wobbles, it could potentially suggest a size for any decadal cosmic ray effect today. Such a step does not appear to have been made of late, even speculatively. If it were, it would be remain highly controversial. As for the work at CERN, it provides a more direct but still complicated method of assessment for the impact of cosmic rays. But we can have a bit of fun assessings the bold assertions of Svensmark and that is a much easier task. If cosmic rays are a big, big driver of climate and responsible for the warming of recent decades, we should be able to see some form of correlation between temperature and cosmic rays over the last decade. So does this SkS post which is showing data up to 2012 support Sensmark? Recently, the level of cosmic rays has been very high of late (this web-page provides the latest data) and these recent high level of cosmic rays should have been peppering the sky with clouds and so should be giving us a big big drop in global temperature. Thus it is a bit of a mystery that we actually find "sorchyissimo!!" with the last four years in turn the warmest on record and this year set is to find a place in the top three. Also, seems to me likely there are some interdependencies here, e.g. photosynthesis converts more CO2 in stronger sunlight, but if this same sunlight also increases biogenic vapour production then this could increase cloud cover and regulate both processes. I’d like to have a stab at some transfer functions to look for instabilities there; but no idea how to estimate the biogenic vapour component. Finally a belated thanks to MA Roger, post 20 above, for the reference. I must say, as suspect as that graph clearly is, more recent, reliable data does seem to reproduce it, at least in part. That, as I understood it, formed a significant part of the first of CLOUD’s goals.